India’s ambitious rail mega-project Dedicated Freight Corridor (DFC) has achieved another milestone by setting a new record in Mechanized Track Linking. The record was set in the Rewari-Iqbalgarh section of Western DFC during the month of July 2017 when DFC laid and linked a total of 41 kms of tracks between New Phulera and New Srimadhopur DFC stations. Another record of maximum laying and linking of tracks in a single day was also set by DFC in the same section. 3.25 kms of track laying and linking was done between Phulera and Pachar Malikpur DFC stations. With this, a total of 736 kms of track linking (Western DFC 370 kms, Eastern DFC 366 kms) has been completed on the DFC. Mechanized Track Linking with the New Track Construction (NTC) Machine is being done for the first time in the history of Indian Railways. The NTC Machine is able to lay an average of 1.5 km of track per day in continuous operation, improving productivity, safety, efficiency and quality. 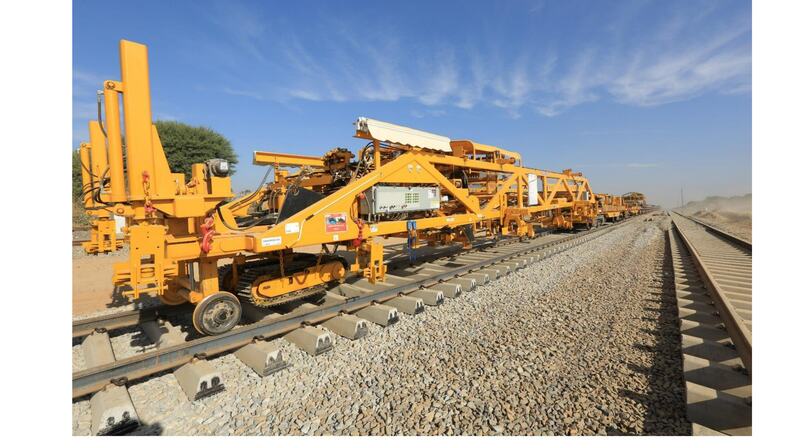 The NTC is able to lay 10 concrete sleepers per minute with precise sleeper spacing and squareness. This is the most efficient and effective way of laying of new tracks. DFCCIL, a special purpose vehicle (SPV) is engaged in planning, construction, operation and maintenance of the Dedicated Freight Corridors and in the first phase, the two corridors, namely Eastern Corridor from Ludhiana to Dankuni (1856 Kms) and the Western Corridor from Dadri to Jawahar Lal Nehru Port (JNPT) (1504 Kms) are being constructed for exclusively movement of Goods Trains. The Eastern Dedicated Freight Corridor from Ludhiana to Dankuni near Kolkata is traversing states of Punjab, Haryana, Uttar Pradesh, Bihar, Jharkhand and West Bengal. The Western Dedicated Freight corridor from Dadri (Uttar Pradesh) to Jawaharlal Nehru Port Trust (Mumbai) is passing through Uttar Pradesh, Haryana, Rajasthan, Gujarat and Maharashtra. The Western Corridors is being funded by Japan International Corporation Agency (JICA), while the Eastern Corridor from Mughalsarai to Ludhiana is being funded by the World Bank.